Mentioned is the way you can write Academic Cover Letter – 1 for your CV or Resume . People looking for jobs can easily download these Academic Cover Letter – 1 for your CV or Resume in word or pdf format or just view it online to copy and paste. 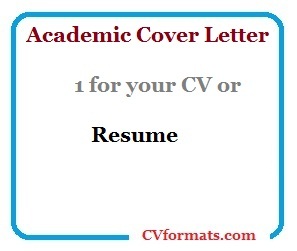 Cover letter of Academic Cover Letter – 1 for your CV or Resume is also available. Just change the name , address , qualification and experience and your Academic Cover Letter – 1 for your CV or Resume is ready. I saw your advertisements for professor of music history position at Millikin University, Decatur, IL in our local newspaper. If the positions have yet to be filled, please consider the brief resume which accompanies this letter. I have completed my Bachelor of Arts and Ph.D. degree in Musicology from University of Illinois. I believe that I meet everyone of the requirements in your job posting. I have enclosed my resume for your review. My enclosed resume details my qualifications and my teaching experience. I have two years of experience as an assistant professor of music history at Covenant College in Illinois. Where my teaching duties include teaching undergraduate courses in music history, music appreciation and writing about music, teaching graduate music history seminars, worked with other faculty members to develop new cross-disciplinary programs and projects in the area of world music, etc. In addition to this I have obtained UW-Madison Summer Musical Theatre Award and UW-Madison Freshman Scholarship. I am very energetic and innovative and have excellent teaching skills. You can find my additional skills and abilities in my enclosed resume. Through my experience as an assistant professor of music history, I have developed confidence and an interest in teaching and look forward to the opportunity to both teach assigned classes and to develop my own classes. I hope you will review my resume and if you agree with what I have stated here then please consider me for the position. If you want any additional information, I am happy to supply it. I look forward to hearing from you. Thank you very much for your consideration.